Here at DeckStainHelp.com, we are proud of the fact that we have become the Internet’s number one reference for your deck stain opinions and reviews. We thank you for your continued support. 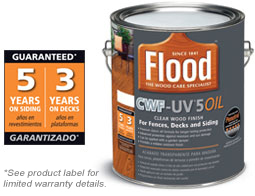 Our customers who have used Flood CWF-UV5 Oil Wood Stain continue to give mixed reviews about the appearance and longevity of their deck stain projects. If you have used Flood CWF-UV5 Oil Wood Stain , we would like to hear what you think, so feel free to leave a comment below and pictures of your completed projects if you have them. – The Flood CWF-UV5 had a nice rich color when applied to the ACQ Pine decking. Golden with a hint of orange color. Knots were a little lighter in color than the rest of the deck but, that is normal for a true oil based stain. Grain was highlighted well. – Color retention was decent. Flooring lost about 30% color, but railings retained much of the original color. – No peeling, but there was wearing around the high traffic areas.